From the “As if I don’t have enough on my plate.” department. 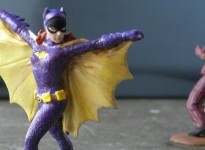 As a collector, I’ve always been greatly disappointed by toys that have been passed off as “Batcopters” that looked nothing like the vintage 40’s Bell 47 helicopter that the Batcopter was modified from. 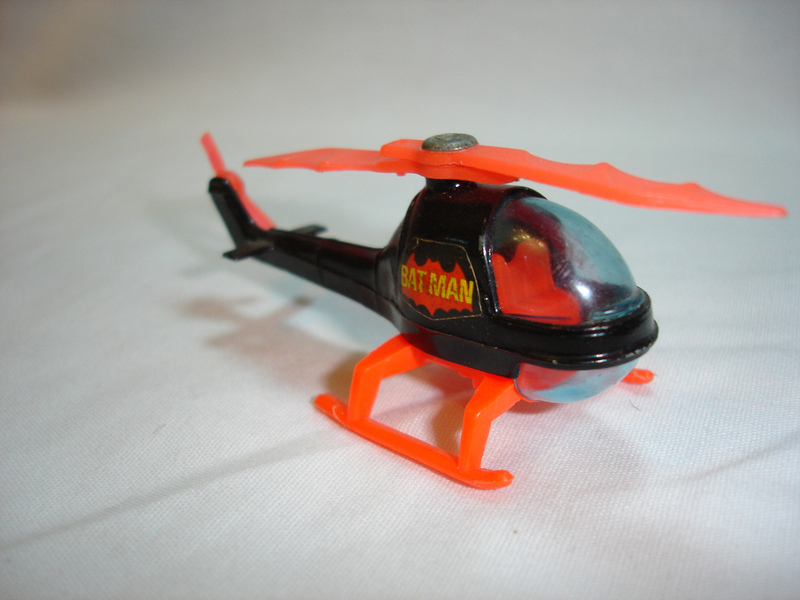 To date, there has been NO officially licensed toy or model Batcopter that has even a passing resemblance to the original vehicle. That’s why with Hot Wheels announcing the upcoming release of an actual Batcopter in their “1:50” diecast vehicle line-up for 2012, and with there being some murmuring from Polar Lights about maybe a Batcopter model kit on the way, (probably a modified Revell M*A*S*H* Bell, which would be fine) it has rekindled my interest in the flying Bat chopper. I’ve customized the Batcopter in several scales over the years. I’ve done it in 1:64, 1:72, 1:48, 1:35, 1:43, and a Mego homage in a 1:8-ish cartoony scale. I was working on a second Mego-esque version recently (complete with shark) and it reminded me of the fact that years ago I had seen photos of a beautiful large scale working RC Batcopter conversion, built by RC Helicopter designer Alan McSwain. 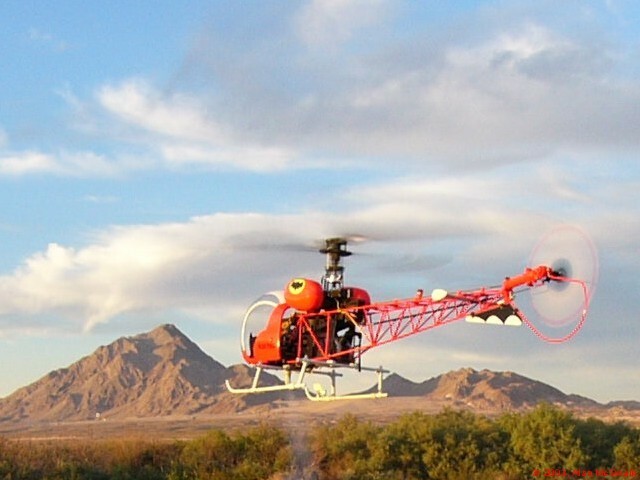 Alan extensively modified a Century Bell 47 RC helicopter kit with precision vinyl design applications, carbon fiber bat-wings and aluminum struts to build a working, flying Batcopter. (note, Alan has only test-flown the model with the Batwings off, though he says they were built to stay on during flight.) I was impressed by how screen-accurate Alan’s model was. I’m always happily surprised when guys seemingly outside our little bat-community just completely nail something from the show with this much passion and attention to detail. Alan’s model surpasses just about every Batcopter conversion model I’ve seen. AND it flies! I’ve always wanted to build a really nice, large, accurate Batcopter. But the few times I’ve looked into it, the base helicopter model alone from Century is over $500.00 I don’t have any desire to build a working RC Batcopter, just one that looks great. And that seemed a bit high for just a base model that I would basically be gutting. Fast-forward to last week, when I spotted a set of Century Bell 47 parts on eBay at a fraction of what they’d go for new. I bid and won the parts. I’ll still need a tail truss cage and the rotors (and maybe a few other parts) but I should be able to fabricate some and acquire others directly from Century. This model is classified at close to 1:6 scale, but will probably look best with 1:9, slightly larger than Mego sized figures in the cockpit. I’m not positive on that yet. I’ll let you know when the parts arrive. I contacted Mr. McSwain who was incredibly gracious and encouraging and sent me his entire design package that he developed for his model. Including vinyl-plotter patterns and vector art. Amazing. Thanks again Alan. I’ll try to do you justice. Alan McSwain's Batcopter in FLIGHT! So now, among all the other bat-projects we’ve got cooking, I’ve got a huge scale-model of the Batcopter in the to-do pile. Ha. This pile is starting to become daunting. 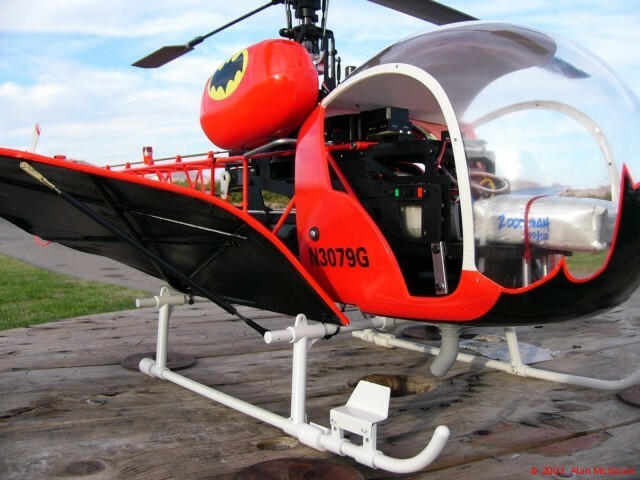 All photos of converted Century Batcopter ©2003 Alan McSwain Used by express permission.